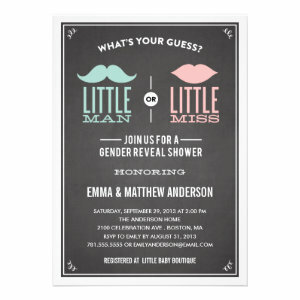 Gender Reveal Baby Shower - The latest trend for themed baby shower parties! Available in many different paper types and sizes. 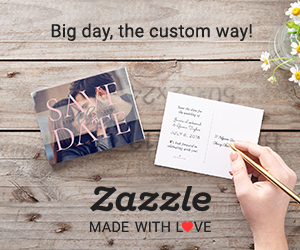 Easily add all the info to both sides of your invitation without any extra cost. 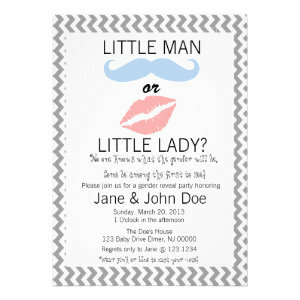 These Gender Reveal Baby Shower Invitations are a great way to invite loved ones to your party. Throwing a baby shower is an exiting time, a time when expectant mothers can get family, friends and loved ones round to have some pre-baby fun. Some soon to be parents like to keep their babies gender a secret until the baby shower party, only to reveal it during the celebrations. This is a lovely way to include your family, friends and party guests in your news and a great way to see everyone's reactions when they hear your exciting news. 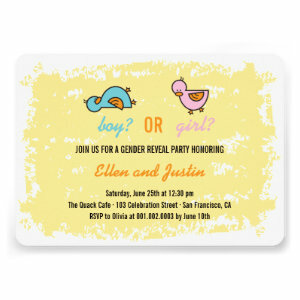 The Gender Reveal Baby Shower Invitations make use of the traditional pink and blue colour scheme, which is simple, cute and looks gorgeous in all of the different designs. 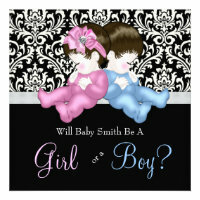 All of the baby shower announcements can be personalized to suit your needs. Change the text, style, layout and colour, quickly and easily. Simply enter your guests details and party information, the finished design will then be delivered direct to your door. Each invitation comes with a plain white envelope. These lovely baby shower invitations can be used for all sorts of baby shower party, like a spring or summer garden party, an open house 'drop in and see me' party, or even a bring a book baby shower. A really popular choice for a baby shower party is hosting an Eco-friendly baby shower where your guests bring upcycled gifts and you give plants as party favors. It's a fun and creative way to announce your babies reveal. 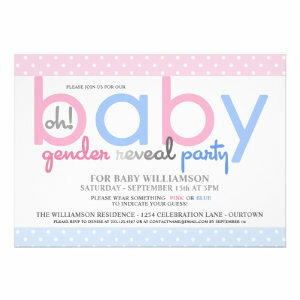 Gender reveal baby shower invitations are the perfect way to get your secret baby shower party off to a good start.